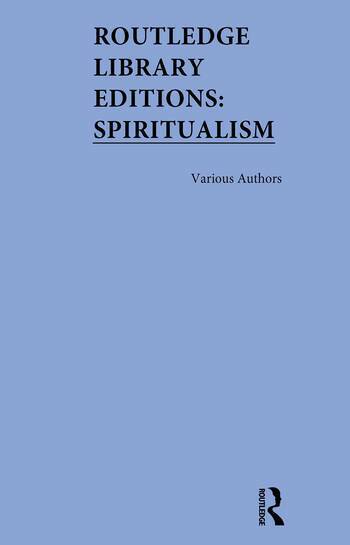 The volumes in this set, originally published between 1974 and 1992, draw together research by leading academics in spiritualism, and provide a rigorous examination of related key issues. The collection examines spirituality from a broad range of disciplines, from the spirituality in the Christian church, spirituality in Africa, and Afro-American religions, as well as examining the areas of channeling, mediumship and spirit possession. In this 3-volume set, there are two incredibly unique and insightful bibliographic source collections, examining both primary and secondary source listings across the subject of spiritualism and one volume providing field research into spirituality in the Christian church and in the occult. This collection is an incredibly useful tool for researchers examining the broad area of spiritualism and will be of interest to researchers, academics and students of anthropology, religion and sociology.